I hate it when bloggers say this, and I do it all the time, but seriously, I really did hear about this the other day. Whatever though, PBN is first to the interwebs with it. But PBN is behind a paywall, so here’s the scoop. 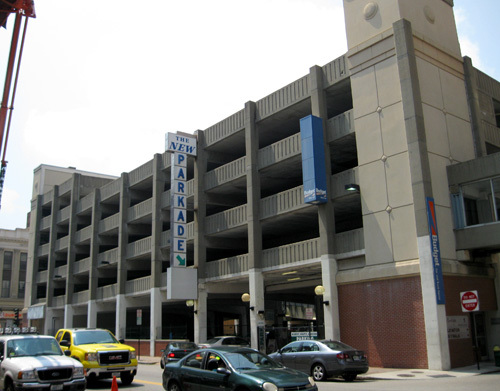 Cornish Associates has purchased the Parkade Garage on Washington Street. Cornish of course has been responsible for much of the redevelopment on Westminster Street including the Peerless Lofts. Cornish plans to renovate the garage and keep it open for public parking as well as leasing spaces to some area businesses. The garage is one of the properties that the Providence Journal’s parent company has been trying to sell in Providence. There’s two things that could end up being quite interesting in relation to this property. First up is Cornish’s long term plans of putting retail in the ground floor along Washington Street (something that I dream about every time I walk by). Currently there is a small office/retail space at the Union Street corner of the garage. This was most recently occupied by Groundwork Providence, but has sat vacant for several years since the Journal ended Groundwork’s lease. Most of the street level facade along Washington Street is well suited to fill in with usable retail space. There are no ramps in the way, the ceilings are high, it is on a busy street, and obviously, parking won’t be an issue. The other potential development here is the Biltmore’s plan to move their driveway from Dorrance Street, to the ‘back’ of the building on Eddy Street, across from the garage. Moving the Biltmore driveway off of Dorrance Street allows the city to potentially make Dorrance Street two-way in front of the Biltmore. So the full length of Dorrance would be two-way from Emmett Square to Dyer Street. The city is also looking at options for making Fountain and Sabin Streets and Exchange Terrace potentially two-way as part of the circulator plan (plans to make Weybosset and Empire two-way are firm). In the photo above, you can see that the Biltmore currently has a giant dumpster on Eddy Street. That dumpster may be moved into the garage, allowing the street to be developed properly for the Biltmore driveway and to get cars into the garage. The Biltmore, as you can plainly see in the photo, is connected to the garage by a skybridge. I have not seen any plans from the Biltmore on this, but I imagine something like what the Hotel Providence has on Mathewson Street. With future development in the base of the garage (and it should be reiterated, this is labeled currently as a “long-term plan” by Cornish), Washington Street suddenly gets a nice retail strip. Good news for the Biltmore in trying to rent out their forlorn retail space at the corner of Eddy and Washington. That space was the home to Garrison Confections years ago and a short lived flower shop. Without other retail destinations around, the Biltmore simply can’t get anything to stick there. 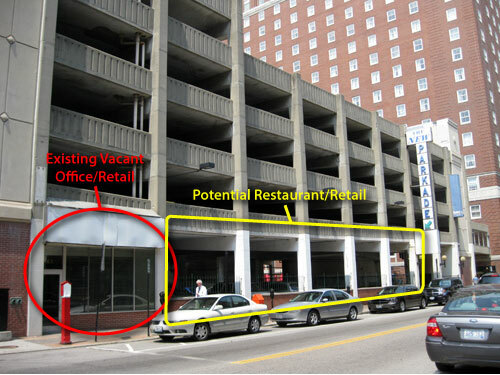 With the driveway on that side of the building and more retail on Washington, that space will have a shot at success. Aside from the Parkade, Washington Street is experiencing a bit of a quiet renaissance. The Narrow Building is being renovated thanks in part to funds from The Providence Revolving Fund. AS220’s Mercantile Block is set to wrap up work shortly, with restored retail on the ground floor, artists lofts and studios above, AS220’s print shop, and the Fab Lab. Coastway Bank is planning to move into the old Washington Trust branch (though I haven’t heard much about that lately…). Washington Street still has a ways to go. The massive parking lot along Mathewson Street (owned by ProJo) is a giant hole in the streetscape. Roger Williams Downcity campus is also doing the streetscape no favors. And the owners of the failed Hotel Sierra site will likely be asking for temporary parking once the work is done on the Mercantile (sigh). I swear this was going to be a positive post, sorry to end on such a down note. Couldn’t Dorrance become 2 way in front of the Biltmore without getting rid of the driveway in front? It seems like a strange change. That driveway sees a TON of traffic when there are events at the Biltmore and it gives visitors a pretty nice place to come into. That’s a pretty grand entranceway vs the back of the building. Even with the driveway there, there is room for 2 lanes of cars going east and 1 lane going west. It just removes any parallel parking there. They could also cut the size of the driveway down to 1 car length if the street needs to be wider. The Hotel Providence doesn’t have more than a car length for their “driveway” which is really more like an indented bus stop. The last time i talked with somebody at Planning and Development I asked about Fountain and Sabin going two way. I was told NO WAY was that ever going to happen. Of course this was a few years ago when they installed the new lights at Empire and Washington. I always thought McCormick and Schmick should have put in some type of walk in sushi\raw bar in that corner spot on Washington. Just walk in slurp a few oysters or a grab a little shashimi and go. Ever since New Japan closed there is no place around there to stop in for a quick bite of raw fish. Actually, I should clarify that I’m not sure that the “city” is considering Fountain and Sabin as two-way, but that some people downtown would at least like it considered. I do know that the city is considering Dorrance going two-way. I hope they clean up that little office spot. When I worked there, it had a scary amount of weird molds, and spores and leaks and drips and mouses and the like. I can only think that that is why they never re-rented it after they kicked out Groundwork Providence in 2006. It is such a great location I cannot believe for a minute that they couldn’t find a tenant. I think it was a very unhealthy office and maybe the Journal didn’t want the hassle. 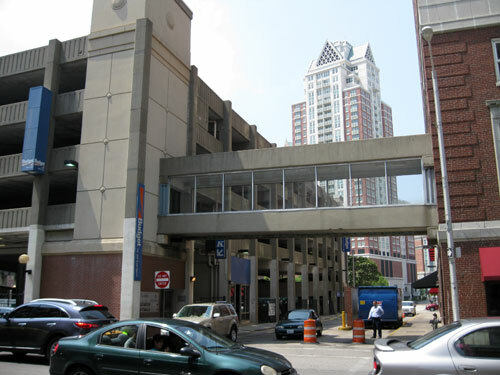 i asked about retail on the ground floor of this garage years ago on some providence forum and was told there was retail here not too long ago but someone had the bright idea to remove it for yet more parking. The current building is a parking garage, nothing special, and in fact, its a bit ruff around the edges. While the planning is still in the beginning stages, its looking like the design overhaul of this parking structure will include a much improved parking facility on the upper floors, some zip cars, maybe a green roof, and a healthy grouping of ground level restaurant and retail spaces, and that’s what we’re getting excited about. I’m thinking a full city block of amazing restaurants, maybe some shops and bars, and all on a small scale. No huge monstrous spaces, but small, compact, manageable spaces filled with some of the best restaurants and bars that Providence has to offer. Spaces for independent business owners to thrive. Outdoor seating, lots of choices, another big step in the ever evolving future of Downcity, and we are excited about the possibilities! It looks like there is some activity on the ground level. they have covered the area along Washington with sheeting and there are construction workers going in and out. And the signs for zip cars are up. I think the cars are there too. Looks like Cornish is making some progress.